This week in the arts, attend Inuit throat singer Tanya Tagaq’s performance that will feature a crowdsourced choir of UW students and regional indigenous people, partake in the Painting + Drawing Open House, visit the Henry to see “Martha Friedman: Castoffs” before it closes, and more. Image: Lizzi Bougatsos. Self–portrait, 2009. 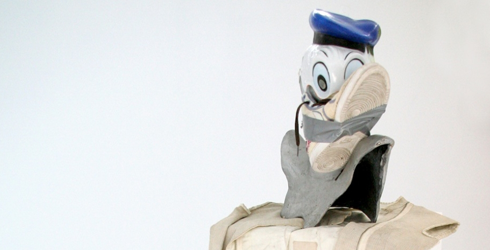 Donald Duck mask, fluorescent Nike sneaker, cross, aluminum bust, fencing jacket, shoe sole, liquid nails. 155 x 39, 5 x 77 cm. Andrea Fraser is an artist whose work investigates the social, financial, and affective economies of cultural institutions, fields, and groups. 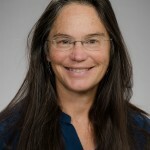 She is Professor, Interdisciplinary Studio Area Head, and Chair of the UCLA Department of Art. Retrospectives of her work have been presented by the Museum Ludwig Cologne (2013), the Museum der Moderne Salzburg (2015), the Museum of Contemporary Art Barcelona and MUAC UNAM Mexico City (both 2016). Her most recent book, 2016 in Museums, Money, and Politics (2018) — co-published by the CCA Wattis Institute, Westreich/Wagner Publications, and MIT Press — documents the political contributions of the board members of over 125 major US art organizations in the 2016 election cycle and its aftermath, examining the intersection of cultural philanthropy and political finance in the age of plutocracy. Due to this event being cancelled, ticket holders may contact the Arts UW Ticket Office for exchange and refund options once normal operations resume. Inuit throat singer Tanya Tagaq employs exquisite, unnerving vocal improvisations that bridge traditional roots with contemporary culture. Her music is like nothing you’ve heard before: a contortion of punk, metal and electronica into a complex and contemporary sound. A tour-de-force vocalist, she has been named to the Order of Canada, one of the country’s highest honors. 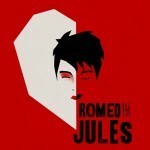 One of today’s most electric, transfixing performers in any genre. 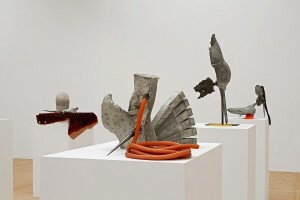 Martha Friedman: Castoffs [installation view, Henry Art Gallery, University of Washington, Seattle, 2010]. Photo: Mark Woods. The ancient two-finger amulet, made of dark stone like obsidian or hematite, was placed in ancient Egyptian coffins, presumably to protect the corpse within. Brooklyn artist Martha Friedman, a master of uneasy forms, places glass-blown versions of these talismans alongside distorted, blobby approximations of the male body. She derived these sculptures from casts of the body of Silas Riener, a dancer and choreographer, before embellishing and altering them with rubber tubing and sheeting and metal spikes. The combination of the fingers and the altered, impaled fragments, enthroned on unadorned pedestals, stimulates an icky, quasi-sexual discomfort and fascination. Friedman’s dissection of the male body might be taken as an inversion of—or revenge for—the age-old male gaze, in which the torso is not only objectified but dismembered. Join us in exploring the private studios of the Master of Fine Arts students in Painting + Drawing. Take advantage of this opportunity to talk with the artists about their completed artworks and work in progress. 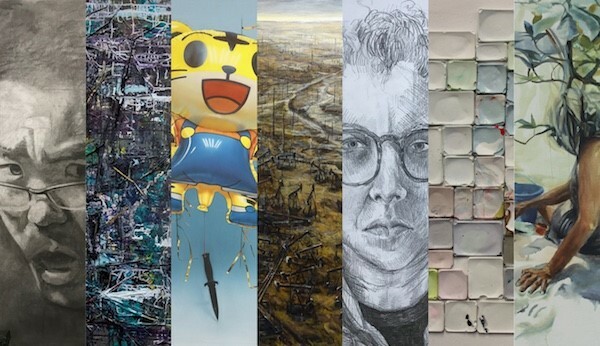 Participating artists are: Lucy Copper, Abigail Drapkin, Pinchuan Huang, Boarong Liang, Todd McKinney, emily charlotte taibleson, and Shuo Yin. The gallery space will have an exhibition of work by undergraduates in Painting + Drawing.